Easy to Install: Easy to attach to your handlebar with the strong velcro closure strap, which can be tailored or adjusted to perfect assembly. 1.ADDED PHONE CASE is made up of TPU Sensitive Touch Screen and Velcro fits for cellphone below 6.0 inch , such as iPhone 7 6s 6 plus 5s 5 / Samsung Galaxy s7 s6 note 7. It has extreme Clear and Sensitive touch screen window, you can easily hit functions on your phone and see the screen clearly through the transparent cover in any condition(Touch ID NOT worked through the cover). 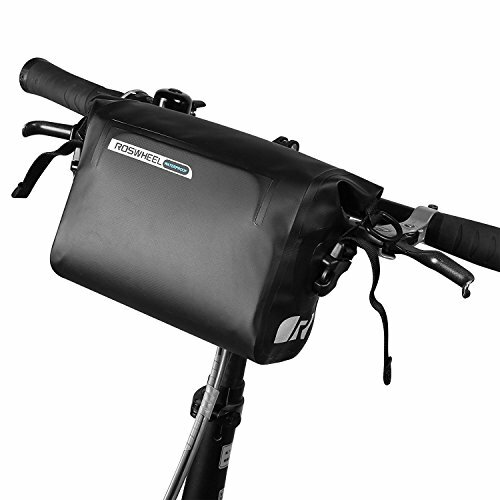 2.3 VELCRO STRAPS on the bag makes it firmer on the handlebar, design for quick release and installation. This bike bag has enough space to hold your phone, USB cable, bicycle repair tools & accessories, dust masks,keys, wallets, etc. 3.SUN VISOR & REFLECTIVE TAPE - Sun Visor on the top helps you watch phone screen clearly even under strong sunlight. Reflective Tape Details on the surface provide a warning effect for night riding to avoid accident. 4.WATERPROOF Material: made by PU & PVC material; polyester material double thick inner pads, provide well SHACKPROOF for your phone when riding on rough road. 5.DUAL ZIPPERS makes it convenient to open or close. You can leave a OUTLET between 2 zippers on the bottom for earphone to listen music or call while riding. Besides, you can charge your phone in the bag by putting in power bank and connectting usb port. LIFETIME REPLACEMENT WARRANTY. 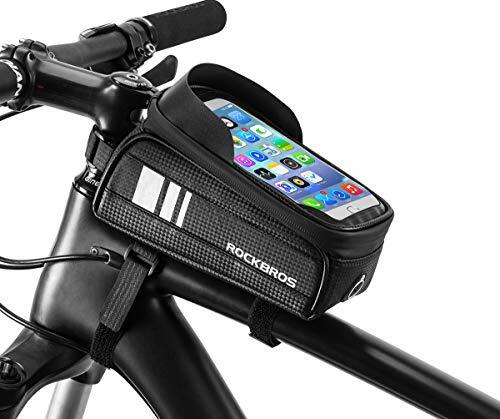 RockBros Bike Phone Bag Waterproof Handlebar Bicycle Phone Case Sensitive Phone Mount Bag Holder Compatible with iPhone X 8 7 Plus 6s Below 6.0"
It is a bicycle storage basket with Reflective Stripe for safe riding. Cooler keeps food and drink warm or cool. Item Features: Transparent TPU touch screen for your cell phone or maps. It is perfect for holding and storing a lot of stuff like wallet, keys, snacks, drink, water, fruit, glasses, tools, gloves and more. 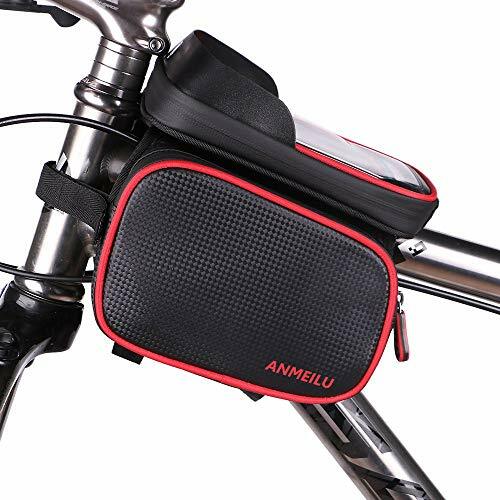 Adjustable velcro easy to equip bag to bicycle handlebar. Larger capacity for storing snacks or drinks for your pleasant bicycle trip. Open this bag by nice and smooth U zip,handy and convenient. Easy to insert and take out the items. After-Sale-Guarantee:if any quality problems comes up within six months, we'd like to replace a new one freely for you. [LARGE CAPACITY & THERMAL INSULATION] Big capacity up to 5.4 L for essentials like small snacks, lunch or cell phone, keys. Side pockets fit a can or plastic bottle well. It can keeps your lunch and drink cold for 1/2 a day with ice pack, or keep them warm for hours. [STURDY AND WATERPROOF] It's made of new cationic 600D polyester, more durable than normal polyester with decent look. Lining material is aluminum film with thermal function and 100% waterproof. [VISIBLE TOUCH SCREEN ON TOP] The clearview sleeve on top can protect your phone in rain, and prevent your phone slide out with its velcro close when bike is tilted. The TPU touch screen allows you to see text, use GPS or answer a phone call with bluetooth earset. Velcro tape on the side to keep your phone safe. [SAFETY ASSURANCE] The bike bag has sliver grey reflective stripes that are highly visible and reflective in dark to ensure safety during riding in dark. 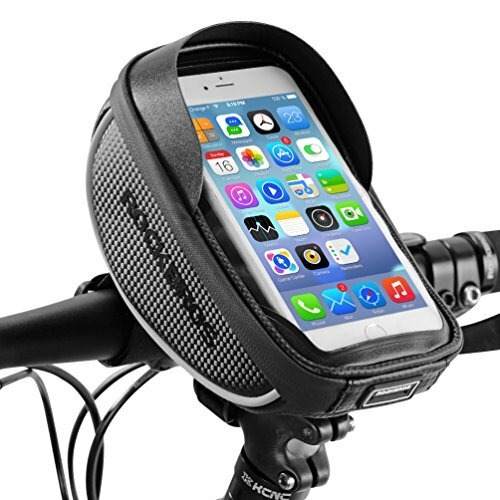 [EASY TO INSTALL] Quickly attach on your bike with three adjustable Velcro, and held up firmly while riding. Convenient use for bike, mountain bike, knee walker or knee scooter. 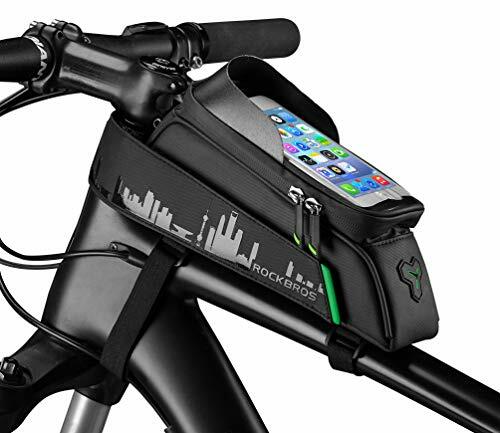 ROCKBROS adds the beautiful scenery of the Bund to the bike phone bag and shares the scenery of the ride. We hope everyone can share the beautiful scenery together, It is also a symbol of friendship. 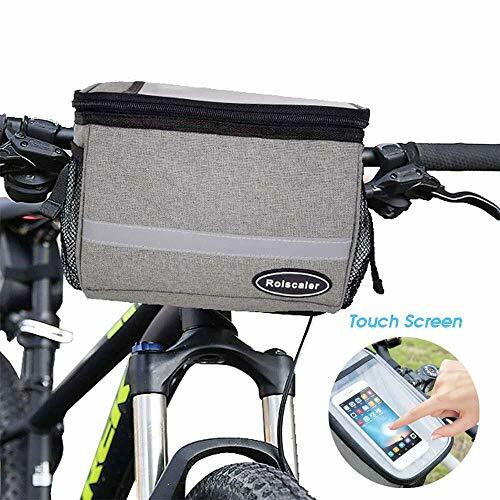 .Fingerprint ID: Not only the touch screen, fingerprint & face recognition is very important, this bike cell phone bag make it easier for you to use. .Front sun visor design to effectively block sunlight and strong night light. Make the bike phone bag free from the reflection of the sun. .Increase the area of one-piece velcro, double firmness fixes your bike bag front tube. within 90 days, will replace it for you or provide a full refund, please buy with confidence. Triangle frame bag comes in either Medium size or Large Size. Carry gear in an easy-to-reach place that minimizes wind-resistance and will not get in the way of knees, feet, or other gear. Great for tools, snacks, wallet, keys and other small items. Top zippers for the main compartment and slim outside pocket. 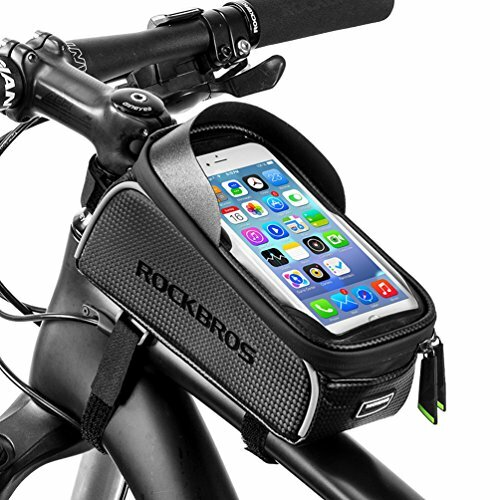 Large Dimensions: 16" x 17" x 11"
ROCK BROS Bike Phone Bag Bicycle Frame Bag, Bicycle Top Tube Bag, Cycling Frame Pannier Pouch, Cellphone Holder Mount, Carbon Fiber, Water Resistant, High Sensitive Touch, Mobile Phone Bag iPhone X XS 8 7 Plus Cellphone Below 6.0"
Extra rain cover can protect you cell phone from water. Both sides of bags reflective signs to protect night ride safety. 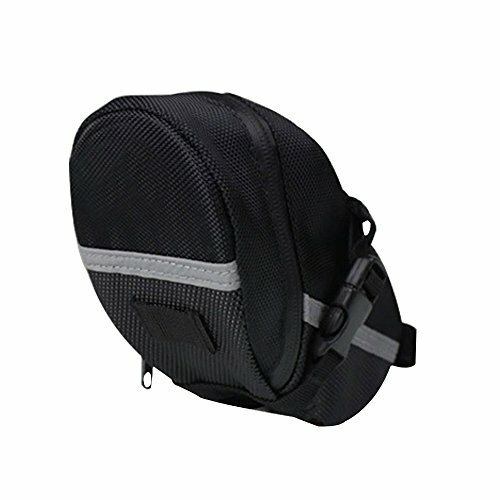 Waterproof & Dust-proof Made of carbon composite PU materials, TURATA bike bag is water resistant if splash water directly. Front Anti-freeze TPU touch screen film make it waterproof and dust-proof on the surface. Sealed double zippers closure on each side prevent any dust into the bike bag. Go cycling in the rain because it's really waterproof. High Sensitive Touch Screen Highly transparent 0.3mm antifreeze TPU materials on the screen helps you operate cell phones sensitively on the road. No stuck while click or slide your phones. Go hiking and riding with TURATA bike bag. Phone Holder & Cards Storage Hold 5.5'' to 6'' smartphones including iPhone 7, iPhone X, iPhone XS, Galaxy S8, Nexus, Moto Z, LG G6. Easy to track the traces and listen to music while riding. With double layers storage space, put cellphone cards earphones and keys in it. Easy to Install and 360 Rotation Install it on the front handlebar with sturdy tubes, rotate the bag in any directions, convenient to wear on the bike and easy to remove. Compatible with road bike, mountain bike, track bike etc. Front Sun Visor & Hidden Earphone Hole With headphone hole on the left side, it's convenient to listen to the music on the road. Front sun visor design can make your reading clearly even under the sunlight. 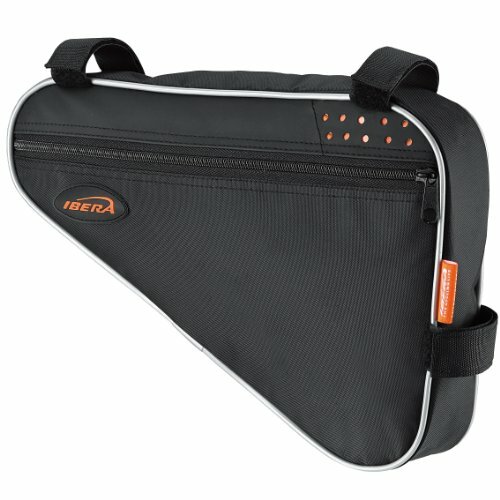 A very good bag pouch for persons who hit the road very often or go on long rides. ,you can roll this bag shorter to meet different needs. [New Upgrade] -- Double thick inner pads make the phone closer to the PU film, improve clarity and touch sensitivity, provide well shockproof for your phone when riding on rough road. 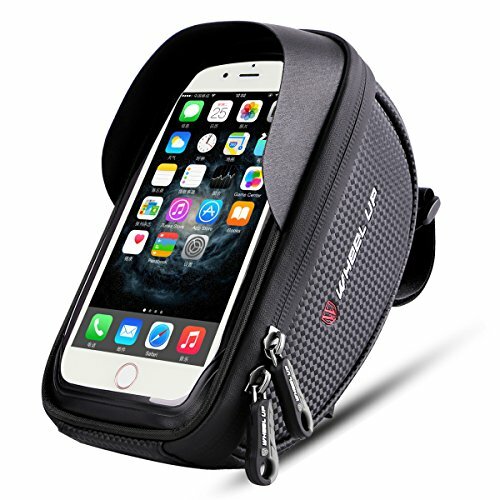 [Perfect For cyclist] -- BicyclePhone Bag Supports one-hand GPS operation, Bicycle Bag upgraded shade design and handsfree call. Bike Bag humanized headphone cord hole very convenient to use. [Enough Space] -- For essential items such as mobile phones, keys, glasses, repair tools, cigarettes, lighters, sunscreen. Also put a power bank inside as an emergency battery for bike lamp to ensure constant riding security. 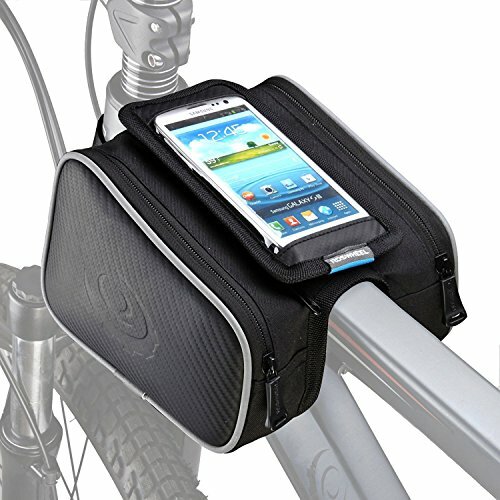 [No Need the Rain Cover] -- This bike phone mount bag disigned by waterproof, rainy days can better protect your cell phones and articles. Velcro straps design makes it is easy to attach and remov. [Phone Size Can Be Placed] -- iphone, Samsung, LG,and other brand mobile phones. Such as iPhone 6/6s/7/7s/8/X Plus, Samsung Galaxy S7/8 note7/8, Huawei P10 etc.which below 6.2 inches. If your bicycle frame is small, place a towel or cloth underneath your bike bag so you can fit it more securely fixed on your bike,and can protect paint from wear. Because of the waterproof design, The zipper will be a bit tight, not quality issue, please do not worry about this. 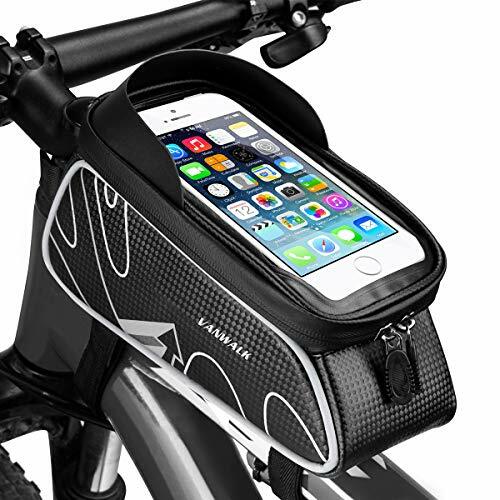  Sensitve Touch Screen -- This bike bag touch screen is made of high sensitive TPU can support phones below 6 inches. Easy to interact with phone through the plastic cover. Convenient to use without taking out the cell phone such as GPS Navigation & Handsfree Call.  Special Designed Cable Outlet On the Bottom -- Special for earphones and USB cables. Listen to music or charging your phone anytime when riding. There is a Velcro underneath the phone pocket that can be easily separated from the bicycle bag. You can directly call, see the news and play games without take out the phone.  Large Capacity With 2 Side Bags -- Has three fully lined storage rooms. Enough space for essential items such as mobile phones, keys, glasses, repair tools, cigarettes, lighters, sunscreen, power bank and so on.  Waterproof & Sun Shade -- Thoroughly Waterproof with waterproof polyurethane(PU) fabric. If you get caught in a rainstorm, no need to worry. Zipper is also waterproof design, it will protect your things from rainy day and wet weather. There is a visor feature over the phone mount. It can help you watch phone screen clearly even under strong sunlight or rainy day. 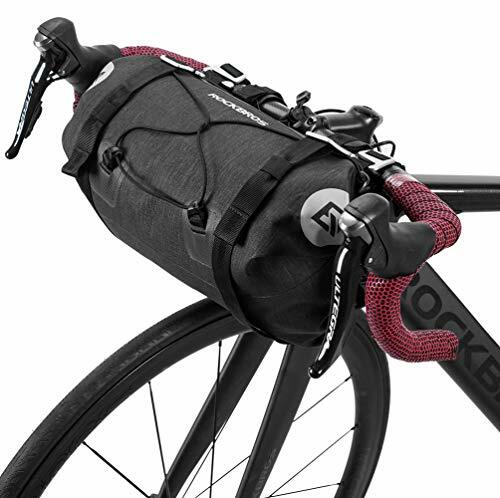  Stability & Tightness -- Bike bag adjustable Velcro strap design for quick attach and detach. Two velcro straps fixed on the top tube. In the front of the bag, there is one velcro strap fixed on the erect handlebar tube. It doesn't move around even if you ride on a bumpy or rocky road.